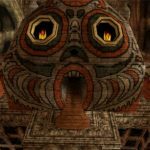 Few games marry whimsy and creepiness together as well as Majora’s Mask does. The game’s narrative, themes, settings, and characters all have incredible designs in regards to the implementation of this dynamic. This was most clear when Link finally made his way to Ikana Canyon and met all of the spooky-yet-charming specters who inhabited this mysterious and ominous land. 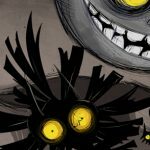 Ikana Festival of the Dead by Spire-III is a beautiful portrait of what makes Majora’s Mask so endearing. The undead monsters in the game, despite being creatures typically reserved for the realms of horror, are full of personality, and Spire-III’s art does an amazing job of reminding everyone of this fact. Yuga’s Art Gallery is a series in which we highlight our favorite artwork from The Legend of Zelda community, as well as some official artwork from the franchise from time to time. Zelda is a series that is constantly changing its style, and after over 30 years of evolving and shifting its visuals, it continues to inspire endless ways for artists to interpret their favorite characters and moments. The piece is surprisingly bright, with the colors and airbrushing making everything seem pleasant and, ironically, very lively. The lights of the fire, bulbs, and even the Moon make the Ikana Canyon inhabitants’ enjoyment of the evening plain to see. And despite the Stone Tower looming in the background to remind them where they are, the Stalchildren, Gibdos, and the Composer Brothers all move and dance to an apparent beat, happy and content with the evening. Even young Pamela seems to enjoy the festivities on display. They’re all dead, but they live their un-lives to the fullest by enjoying a festival. 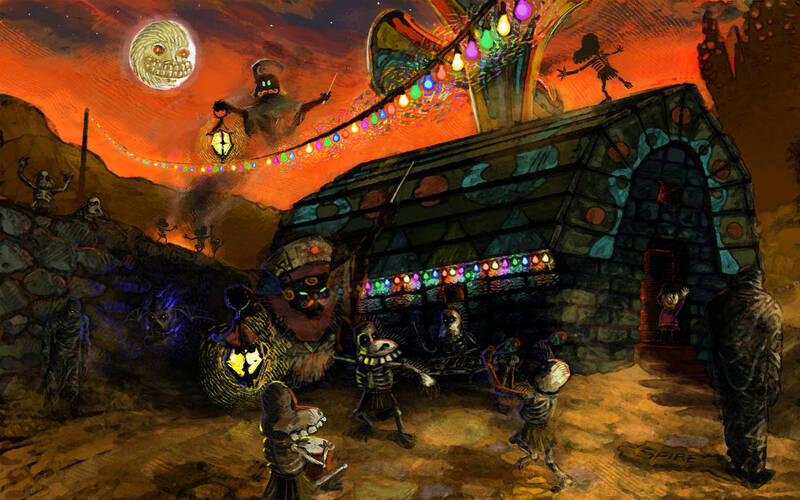 A Festival of the Dead is an interesting concept for Majora’s Mask. The event does not actually happen in the game, but the idea that the cursed inhabitants put on their own party, possibly as a counterpart to Clock Town’s Festival of Time, is interesting. The festival also feels reminiscent of the Mexican Day of the Dead in the sense of being a celebration of those who have passed. The only difference here is that the ones who have passed are the ones actually doing the celebrating. There’s something everyone can appreciate about a person or group of people finding enjoyment in a less-than-optimal situation. Circumstances may not be too great when compared to others (in this case it’s the other uncursed lands of Termina), but knowing how to thrive in a harsh environment or situation is a type of key to happiness. It’s refreshingly cheerful. Spire-III got a lot right about their subject with Ikana Festival of the Dead. 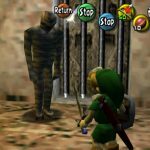 The fun and quirkiness of the characters while still being recognizable as the stuff of nightmares is what made Link’s journey through this part of the game so memorable. It is a prime example of how Legend of Zelda games do a great job of making things, especially characters, become more than what is expected of them.